Sounds weird, right? Maybe even a little gross? No, bear with me…it’s good. Honest. R and I were in Shanghai in August. It’s a crazy city– crowded, and with tons of new construction going up all over the place. In the middle of it all, I ran into someone I used to work with in New York years ago in my past life as an investment banker. But that’s a different story. As a break from stuffing ourselves with crab xiao long bao , we headed over to a “western” cafe in Pudong called Slice for breakfast one morning. I wanted to go there because I had read that a Shanghai-based baker from New Zealand named Dean Brettschneider makes the breads. I am a big fan of his book Taste (and am searching secondhand bookstores for his previous and now out-of-print book Baker…if anyone has it, are you taking bids? ), so I naturally wanted to try his stuff. I happily munched away on the best bagel and rye bread I’ve had since leaving NYC, while Rich ordered this couscous stuff off the menu. It had dried fruit and nuts, yogurt on top and just a touch of sweetness. I was poking through the pantry the other day, and noticed that I had just enough couscous left for one person. 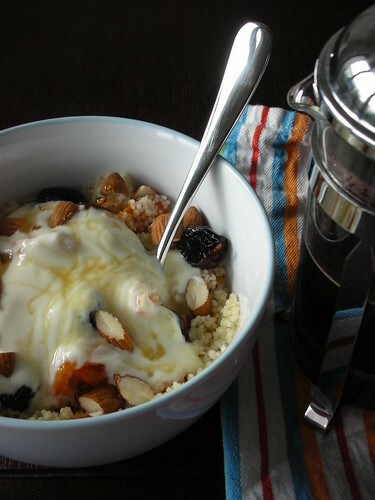 Why not make breakfast couscous with it the next morning? I completely eyeballed everything, so I won’t give a hard and fast recipe, just a basic guideline. -Make as much couscous as you like (for one serving, I used 1/2 cup of dried couscous), according to package instructions, but add a touch of honey to the hot water so it can be absorbed into the couscous along with the liquid. -Put as much dried fruit as you want to use (I used a handful of dried apricots, chopped, and some dried cherries) into a small bowl and cover with boiling water to plump while the couscous sits. -When your couscous has absorbed the water and softened, fluff it up with a fork. Drain the dried fruit and mix into the couscous. -Sprinkle with nuts (I used chopped almonds, but pistachios would be great, too) and top with a couple of spoonfuls of plain yogurt. It doesn’t sound bad to me! This is such a wonderful idea for a healthy breakfast, but somehow the pictures still look completely sinful and decadent! Thanks for sharing, I’ll definitely have to try this out! I admit when I read the title I made this face: O__o …but it looks really good! I may have to try this just out of scientific interest – I’ll tell you how it goes, heh. The flavours certainly sound right…. very creative. Coucous for breakfast…what a great idea. Looks very different but good! I know that is something my husband would eat so I will have to give it a try. I found you on the Foodie Blogroll. I love love love your blog. You have some of the most beautiful pictures of food I have ever seen. I’m going to have to take your word for this recipe. 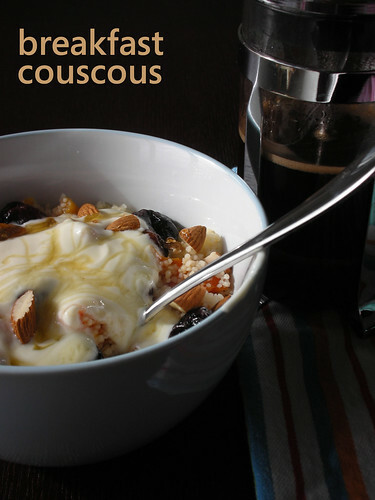 I just don’t think I can handle couscous in the morning, but it really is a lovely idea for those of you with hearty early stomachs. Nice image and of course I’m always a fan of the amazing coffee press. Best coffee ever. I’ve never had it, but I will now, looks great to me! Your photos could convince me to try anything! My mouth is watering! I love the photo! I did it once because we had ran out of grits and oatmeal, and loved it. Your version is just yummy for breakfast! Beatiful shots as always! Great new way to eat one of my favorite grains! Yummy!